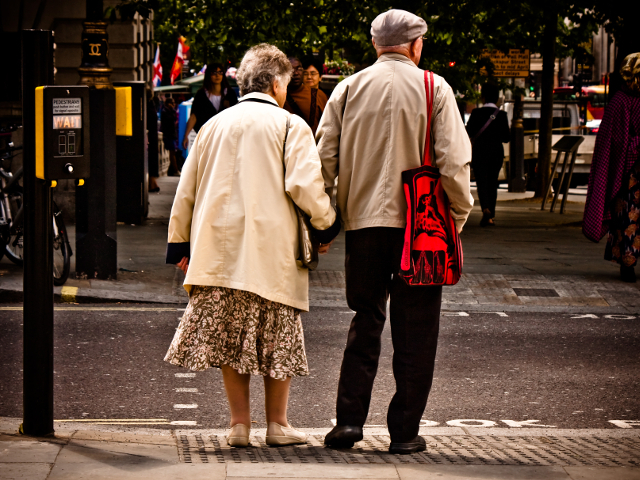 An elderly couple crosses the street hand in hand. Photo by garryknight. Think back to the last time you helped an elderly person cross the street. In most cases, you’ll remember making it up and over the opposite curb with just seconds to spare before the wall of rumbling oncoming traffic got their green go-ahead signal. Now, as this memory dawns on you, have you ever stopped to think about why this always seems to happen? Well, there’s a reason. For a long time, it’s been assumed that people cross the street at a pace of about 4 feet per second. Crosswalks are timed using this number. However, most 80-year old people don’t move at that pace anymore. In fact, a better crosswalk speed would be one closer to 3 feet per second. A few decades ago, this simply wasn’t something that had to be worried about. In the 1960’s, the majority of people didn’t live past 70, or 75. Today, the vast majority of the baby boom generation will age well into their 70’s and beyond. Between now and 2031, there will be 10,000 baby boomers turning 65 every day, by which point every one in five people living in America will be older than 65. As these generations age, the demographics of entire cities will age with them. When organizations work toward protecting vulnerable road users, their efforts benefit the elderly even if the changes weren’t developed specifically with them in mind. Since the elderly are one of the most vulnerable groups of road users, any change that is made to positively impact pedestrian safety will also automatically mean a positive change for elderly pedestrians. A one second difference in the timer of a crosswalk might seem small, or even insignificant, but it’s become only one small piece in a much larger and deep-rooted issue. Are there benches available to stop and catch your breath? Is there a cut in the curb for a walker? Age-proofing our cities is likely to prove quite the challenge to urban design, and unfortunately in most places we’re incredibly ill-prepared. The most decline is found in the “oldest of the old,” who don’t tend to leave their homes as often as younger people. When a bank or supermarket closes in a neighborhood, they’re the population that is affected. This has strong implications for future urban planning. However, researchers at the Massachusetts Institute of Technology AgeLab and the AARP, a nonprofit membership for people age 50 and over that is dedicated to enhancing quality of life as people age, have been able to give us a better insight and understanding than we ever have before of how elderly people get around and exactly what it is they might need. “Walking audits” of individual streets and intersections are conducted by the AARP, traveling on crutches and walkers to document uneven sidewalks or missing bus benches. The AgeLab takes it a step further, with AGNES, its Age Gain Now Empathy System suit that allows a nimble 20-something body to mimic that of someone closer to 75, and experience the strength, mobility and vision loss that comes with it. With the data and findings from research such as this, cities can take steps toward creating more age-friendly environments for their rapidly aging populations. These changes would be beneficial to all residents, not just the elderly. Think about a curb cut-out, for example. Everyone uses it, not just people with strollers or wheelchairs. The same concept would transfer to covered bus stops, tree-lined streets, well-lit subway entrances and clearer road signs. Did you know Times Roman style is easier to read than Sans Serif? Type face style is only one example of how a change to improve quality for one group would in fact improve quality for all groups. Taking the changing world and its demographics into consideration when planning our urban areas, and tweaking what already exists, is beneficial to everyone in the long run. After all, eventually we’ll all be old one day and find that these seemingly small issues aren’t so small to us anymore.